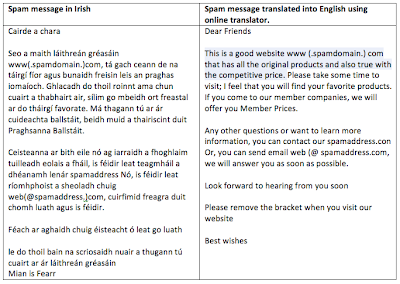 Turscar ríomhphoist – Spam Email (in Irish)! According to the 2002 Census of the Population, 42% of the population of Ireland has the ability to speak Irish. Irish has also had official and working language status at the EU level since January 1, 2007. 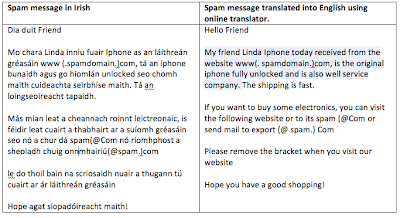 Recently, some examples of spam messages in Irish—the official language of the Republic of Ireland—have been observed. When translated by a fluent Irish speaker into English, it translates as “Please remove destroyers when you come on a visit to our website.” “Greasain” can also mean coverage—as in the case of a cell phone—but the structure of the sentence is incorrect, which indicates that it is a literal translation from English.